While most people think of Twitter only for it’s 140 character text messages, the service was great as a way to social share photos well before Instagram was around. Originally, a photo had to be put someplace to link to, then there was a couple external services that held the photos automatically for you and now Twitter does the storage and presentation of photos for you. Twitter apps have the ability built into them to post a photo with a text. The only negative to this way of sharing photos is that others have to click on the link and make a jump to another page to see your photo. The service isn’t set up to just view the photos, sweeping through to the one that needs your comment. The developers of Scopy must have noticed this too as their iPhone app lets you easily see just the photos attached to Twitter posts. You can view the photos as a list to sweep through or as thumbnails. 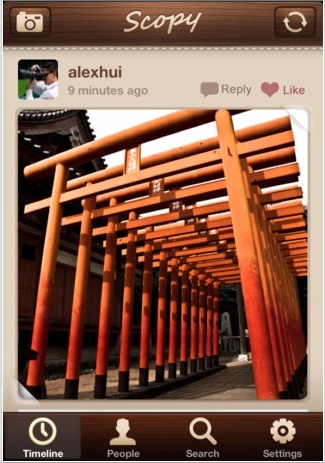 Along with the photos is any text or geolocation information in the post with the photo. Scopy is also handy for posting your photos. There is a small group of filters to apply, as well text and location information.